It was hectic as always today. Cookies got up very early for his activities, and I decided to be good wifey and get up with him 0_o. Helped with some stuff and took dog for a walk. Then came back and had really productive morning – really sometimes I surprise even myself 0_o Though got nice price for my effort – I love clothes shopping 😀 In the meantime Cookies was smsing me about dinner tonite and I said I don’t know what we are eating today… When he came back we went again 0_o this time to buy … hehehe lets just say it was needed. Then we stopped in Auchan for some dog food and Cookies ANOTHER micro sd card which happened to be in extreme promotion… I think he has already 5 of those 0_o, thank god he didn’t want another external hard drive, yet, do not get me started on that! Then Cookies mentioned that I didn’t buy my favourite cooking magazine yet, so we did and guess what … there was it. 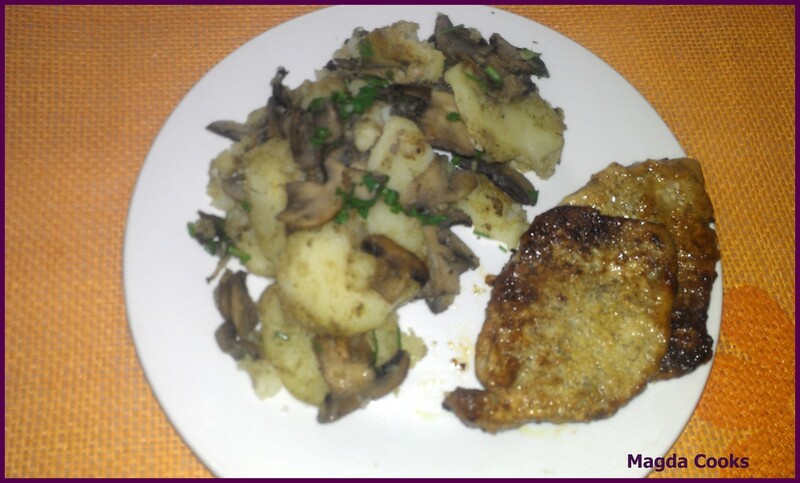 Inside was this awesome recipe for mustard-honey pork loin cutlets with mushroom-potatoes…. really sounds complicated? Nah, very easy and very tasty. Start from boiling potatoes (can be leftovers), slice them not too thin neither too thick. Beat cutlets to soften the meat, salt and pepper on both sides. One side smear with mustard and pour honey on top, set aside. Prepare mushrooms, clean and slice. Heat butter with a little bit of oil and put mushrooms in, fry as long as they become brown, add potatoes and thyme or mushroom spice and fry together stirring from time to time. On the second pan heat a little butter with oil and fry cutlets on one side, and cover the top with leftover mustard and honey. Flip and fry until golden brown on both sides. Serve with fresh crunchy lettuce or House Salad and dressing of your choice. P.S. Cookies thoughts: I do not have ENOUGH FLASH storage woman. I am a very busy person, I need storage.. upon storage solutions. Shut your mouth… and do what you do best, that’s right Magda Cooks… it just RIGHT!